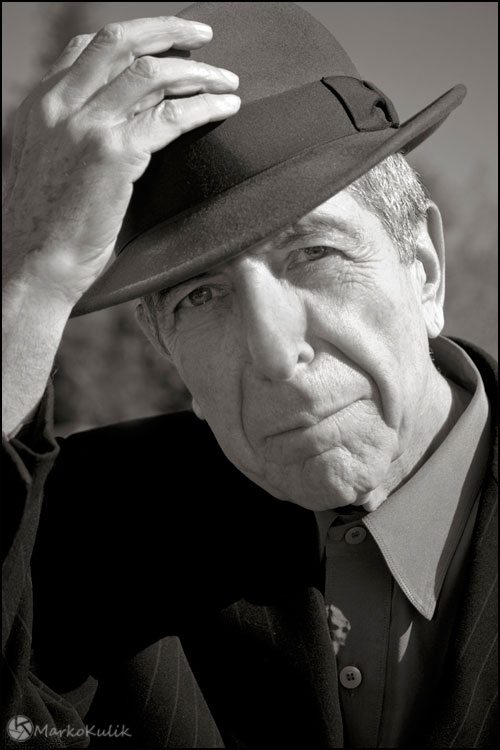 A cou­ple of weeks ago I was lucky enough to meet the Poet/Singer/Songwriter Leonard Cohen in Sague­nay Que­bec. I have always been an enor­mous fan and rarely does a week go by when I don’t lis­ten to one of his truly great songs. Although we only spent a few pre­cious min­utes with him, he was gra­cious enough to allow us to take a few shots. This shot was my favourite of the few shots we took. It was a hot sunny cloud­less day and the sun was still fairly high which meant I had to be on the look­out for shad­ows in the face. I there­fore set my flash to minus 2 which would fill in the poten­tial shad­ows. This shot was orig­i­nally processed in colour and I really like how it turned out (maybe I’ll post the colour ver­sion some­time). How­ever there is some­thing time­less and mys­te­ri­ous about Mr. Cohen’s music and I knew when I took the image that I’d likely process it in black and white. Also, his suit and hat were just scream­ing to be pho­tographed in black and white. I’d like to thank Leonard Cohen (and his UNBELIEVABLE ensem­ble of musi­cians) for the fan­tas­tic con­cert where he received at least 15 stand­ing ova­tions, and for allow­ing me the plea­sure to take a few shots. My only regret is that my wife (who is equally an enor­mous fan) wasn’t there to meet him with me. She was rest­ing at the hotel since she was tired from the 5 hour drive from Montreal.